Joe Roberts is in his third season of Moto2 World Championship racing. The sole American in the Grand Prix paddock, the hopes of American racing fans to have a top-notch rider in the world championships rest squarely on his shoulders. Looking at Roberts’ results on paper, it’s not encouraging. In his first two seasons he scored world championship points in exactly three races. The one highlight was a top-10 finish (10th) in wet conditions at Brno in 2017. Roberts has kicked off 2019 with a pair of 22nd-place results. Yet in spite of his lackluster start to 2019, Roberts remains confident that much better results are just around the corner. 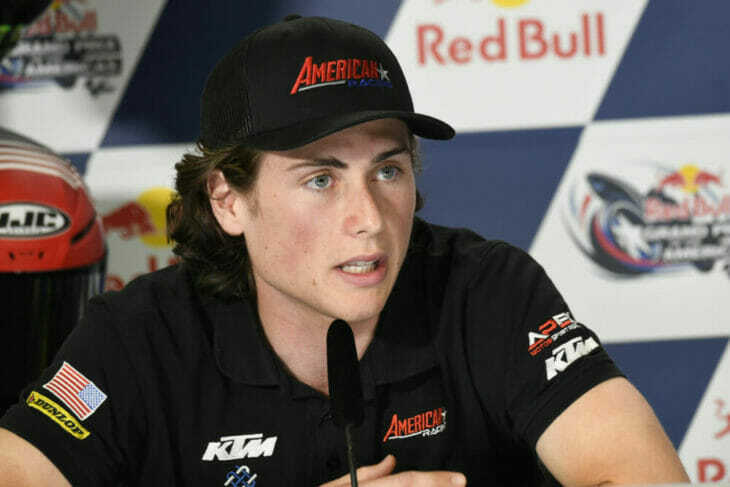 Roberts was a participant in the pre-event MotoGP press conference at the Circuit of the Americas on Thursday, and spoke about working to make progress on getting a handle on his American Racing KTM racing machine. “It’s fantastic to be here, I always love coming to Austin,” Roberts said. “Before I was even racing at a world level, it was always a favourite city to visit. Just to be here with all the fans and everything, it’s always a nice feeling. “In terms of how the year’s gone, to be honest, it’s been a bit of a difficult start; it’s not where I hoped to be in Qatar. But you know what, we made a lot of progress in the last round, even though on the timesheets you really couldn’t see it. During the race I was on for my best gap to the front before I crashed. One issue facing the 21 year old from Los Angeles, is that he’s now raced on three different chassis in three seasons. IN 2017 he was on a Kalex, last year it was the NTS and this year a KTM. He said the Kalex was fairly easy to set up since so many teams ride on that chassis. Then with the NTS is was just himself and then teammate Steven Odendaal riding on that particular chassis, so Roberts said they were often hampered by the lack of data. Currently Roberts says the new KTM with the Triumph engine, has a completely different feel from the previous Honda-powered Moto2 bikes he raced. He said he is still adjusting to the new KTM, primarily in trying to find front-end feel. He also points out the chassis seems very sensitive to track temperature. When asked how long he might stay in the series if his results didn’t significantly improve, Roberts brushed off any thoughts of not getting things turned around. “That won’t be the case,” he quickly said. “We’re going to make steps forward. I already have the confidence. I went back to California, and went to Supermoto tracks where I set a certain times and I’m destroying my lap records. So it’s not a case of confidence or my ability. Right now the team dynamic, there are a lot of new people, a lot of new things and it takes a couple of races to find that and I would be surprised if I was running near the back like this much longer. One very good sign of Roberts’ commitment to doing well in Moto2, is that he’s not even thinking about alternatives, such as coming back to race in MotoAmerica. I started to ask if he would be happier winning at the national level or finishing midpack in the world championships, but before I could even complete the sentence Roberts interrupted and said, “Yeah, maybe I could be winning, but is it on the world level?” I replied, “No.” “Exactly,” he said emphatically. On the personal side, Roberts is now living during much of the racing season in a small community on the outskirts of Barcelona. He said he enjoys it there. He mentions the enthusiasm the Spanish people have for racing is unlike anything he ever experienced here in the States. With Roberts, American fans do have a rider to root for, and he’s hoping to give them something to cheer about very soon.